What do the movies “Frozen,” “Space Jam” and nearly every other film shown at the Cosford Cinema since 1982 have in common? Michael Blaine, the Cosford’s projectionist, has been responsible for displaying every single one on the big screen. Blaine, 70, has spent the last 32 years projecting movies at Cosford. Throughout his tenure, he has shown countless movies in today’s digital style and on traditional celluloid film, the thin, transparent strips where a movie’s individual frames are printed – or used to be printed. The curtain has closed for physical films over the years, giving digital movies prime time in the spotlight. Cosford, however, still uses two 35 millimeter film projectors, and according to Cosford Cinema Director Trae DeLellis, Blaine is one of the few people left who can manage them. The years have been unkind to the projectionist profession, with demand reaching an all-time low that is still plummeting, according to Blaine. Blaine’s experience with 35 mm projectors has made him quite the asset for Cosford’s monthly special event Cosford Classics, where older films are shown in the 35 mm format. According to Oscar Jubis, a management assistant at the Cosford Cinema, projection requires attention to detail. “A good projectionist is someone who is constantly concerned about the film being seen and heard to its best advantage,” Jubis said. Up the stairs by Cosford on Dooley Memorial building’s third floor is a set of steel steps leading to a massive door. Behind that door resides the steel-walled projection room, where Blaine works the 35 mm and recently added high-definition projectors, all three of which take up much of the room’s little space. However, Blaine still manages to have posters from past film festivals and stacks of film reel cases around the room. His personal collection of movie memorabilia exceeds the projection room’s size. Since before he began working at Cosford, Blaine has collected and bought all sorts of items, such as books and posters autographed by famous actors, artists, actresses and movie directors. Being an avid collector has its perks; items with initially low value can be appreciated over time. Blaine makes it a point to collect and keep as many items as he can find. He stores the more fragile pieces of his collection, like paper items, in plastic-sealed folders. One item in particular, a Campbell’s soup can wrapper, was signed by American artist Andy Warhol when he visited the Lowe Art Museum in 1980. According to Blaine, the wrapper, initially worth $3 to $5, is now valued at about $2,000. Like his collectables, Blaine’s career as a projectionist has been priceless. Prior to working as a projectionist, he spent weekends and weekdays watching movies. Blaine’s dedication to film led him to destinations that further kindled his love for the movies. One such place, the British Film Institute in London, inspired Blaine to start his collection of theatrical works. 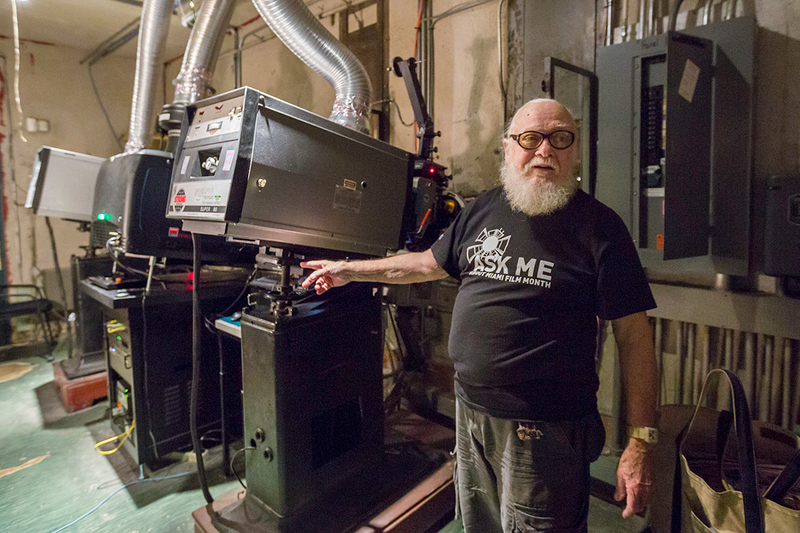 Though the era of projectionists has long faded to black, Blaine’s passion for theater and film continues even today, and he is willing to share that enthusiasm with anyone who will listen.